The printer's place in a modern office has changed. Now more than ever, it's not just about the quality of the prints you can create. There's now more emphasis on wireless sharing and networking. Some of the most important questions you need to ask yourself are: what will the printer be used for and how often will you need to use it? Figuring out what type of printing tasks need to be carried out and the quality of imagery that needs to be produced can help you narrow down your search for the perfect model. Do your documents need to be printed in colour or will black and white prints suffice? Does your office really need a model that can scan, fax, print, and copy? There's no point buying or renting a printer that performs more tasks than required. Different offices can have very different needs. A law firm may require a printer that's capable of printing documents at high speeds with more of a focus on economic ink consumption. A marketing agency may require a printer that prioritises image printing quality for reviewing graphics in marketing briefs. Two of the best-selling printer brands we offer to customers include Toshiba and OKI. Each has their own unique features. Depending on what your office needs, there could a perfect model in the form of a Toshiba or OKI printer. Every workplace relies on a budget for office resources. Before deciding to buy a model, it's important to recognise the cost of a printer. Don't just think about the initial cost of purchasing the printer, think about the ongoing costs of maintaining it. Replacing ink cartridges and paper are just two examples of running costs along with any service or repairs required. Sometimes the more advanced features of a printer/copier can end up making it cheaper to setup and maintain. Many models of Toshiba printers offer cloud printing along with smartphone and iPad integration. Features such as cloud printing can eliminate the need to install network cabling. The cost of installing infrastructure to support wired networking solutions for connecting computers to printers can be significant. When a printer model has fewer parts and functions, this can also serve as an advantage. OKI printers are characterised by their LED printing technology. This technology uses fewer parts when compared to laser printing. Fewer moving parts can make OKI printers less likely to break down and equates to less money spent on maintenance and service. 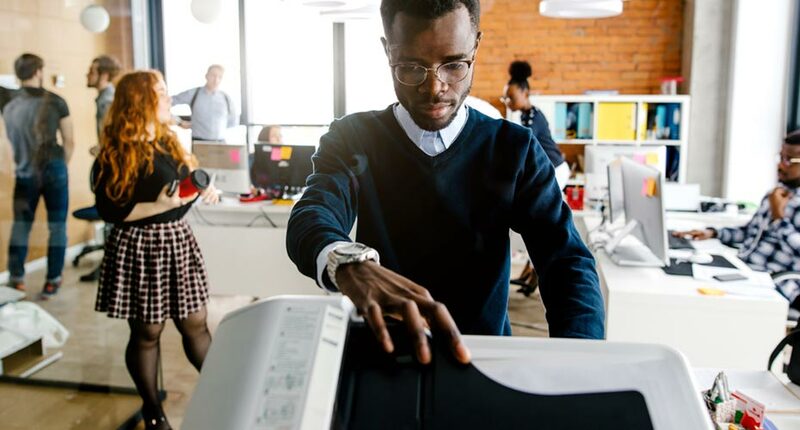 Deciding on which printer is right for your office is just a matter of weighing up the features and benefits they offer. Utilising a Toshiba model can help eliminate the need for installing more physical infrastructure in your office. OKI models feature less moving parts, and therefore less maintenance and servicing is required. Determine which model is more relevant to your office's needs, and you'll be well on your way to making an informed decision. Both our ranges of OKI and Toshiba models can provide a reliable solution for your office needs. Deciding on which one is the right fit for your workplace can depend on the types of tasks carried out and how often these tasks need to be done. Toshiba copiers and printers are renown for their rugged and reliable design. Built to handle high quantities of prints, it's no wonder these models are popular among schools and government organisations. With higher speeds for printing, scanning and copying tasks, these models can turnover a higher amount of prints per month than most other leading brands on the market. Thanks to their simple design, OKI printers are less likely to break down or malfunction. These models are simpler in design because they have less moving parts. OKI models are more suited to semi-regular use. Although it has great document capture and distribution capabilities, it is not designed for constant and heavy use like a Toshiba. When comparing these two brands for reliability, Toshiba is more accustom to larger offices with higher demands in quantity and a faster turnover rate. OKI printers are more suited to smaller offices with less frequency in use but added flexibility in the tasks that need to be performed. Your office may require a printer model that's designed more for efficient printing rather than picture quality. OKI and Toshiba printers have their own sets of features that are designed to perform certain tasks. It's up to you to determine which of these tasks are being performed in your office. Toshiba printers are designed for heavy usage. With the promise of high-speed printing, scanning and photocopying, less time is wasted in the office preparing paper documents. One of the smartest and most time-saving features that you'll find in our Toshiba printers is the double-sided scanning function. If you need to scan in and save large numbers of double-sided documents, this function will save your office valuable time. OKI printers, are generally, are simpler and easier to use. Our OKI printer models can perform a wide range of print tasks for diverse office environments. From document capture to distribution, OKI simplifies document-intensive processes and streamlines workflow in your office. Identifying what's crucial for the office can save your company time and money. There's no need buy or rent a model if all of its features are not going to be used. Our Toshiba models are capable of performing advanced document handling tasks at high speeds and high volume. Our range of OKI models lend themselves to simplifying document-intensive tasks and are more resilient to long-term use. Don't overestimate what your office needs. Identify what printing and copying tasks are regularly carried out before acquiring a new model. Whichever brand or model you choose, you can be confident that the Copysonic team will be there to support you. Our experienced team know Toshiba and OKI systems inside and out. Whether you need a machine for occasional or heavy use, they can help you make an informed decision. All of our photocopiers come with a 12 month warranty on parts, labour and toner. We can even cover your machine for life with our optional extended warranty. For any queries on Toshiba and OKI printers, enquire online or call [phone].